NETWORK FINALS: LITTLE BIG SHOTS gained 0.1 in final numbers. There were no changes to the preliminary ratings for THE ESPYS or SALVATION. CABLE HIGHLIGHTS: Bravo’s REAL HOUSEWIVES OF NYC topped Wednesday cable at 0.52, down 0.03 from last week, and its lead-out was the season premiere of ODD MOM OUT at 0.21. SUITS returned to USA at 0.36, down a substantial 0.17 from the 2016 premiere, but up 0.04 from the March 2017 finale. On ID, MURDER BY NUMBERS premiered at 0.35, and THE PERFECT MURDER was up 0.05 to 0.32. A BLACK INK CREW special on VH1 was at 0.29. On Tru, INSIDE JOKES gave a 0.24 lead-in to the premiere of I’M SORRY at 0.16/0.10. OWN’s QUEEN SUGAR ticked up to 0.44. Discovery’s ALASKAN BUSH PEOPLE fell a big 0.23 to 0.42, and HOMESTEAD RESCUE was down a more moderate 0.04 to 0.33. Lifetime’s LITTLE WOMEN LA REUNION special was at 0.39, up a tick from last week’s official finale. FX’s SNOWFALL took a 0.19 hit from last week’s series premiere to 0.39. MTV’s CATFISH was another show with a big drop, down 0.15 to 0.37. Fox Sports 1’s CONCACAF GOLD CUP match was at 0.36, and ESPN’s NBA SUMMER LEAGUE game was at 0.28. In the cable news race, MSNBC’s RACHEL MADDOW SHOW was again the leader in 18-49s at 0.36/2.8M, with CNN’s ANDERSON COOPER 360 at 0.27/1.2M, and Fox News’s TUCKER CARLSON TONIGHT at 0.24/2.5M. On HGTV, PROPERTY BROTHERS was at 0.33, HOUSE HUNTERS INTL dropped 0.03 to 0.32, and HOUSE HUNTERS was down 0.04 to 0.29. Spike’s LIP SYNC BATTLE rose 0.08 to 0.30. 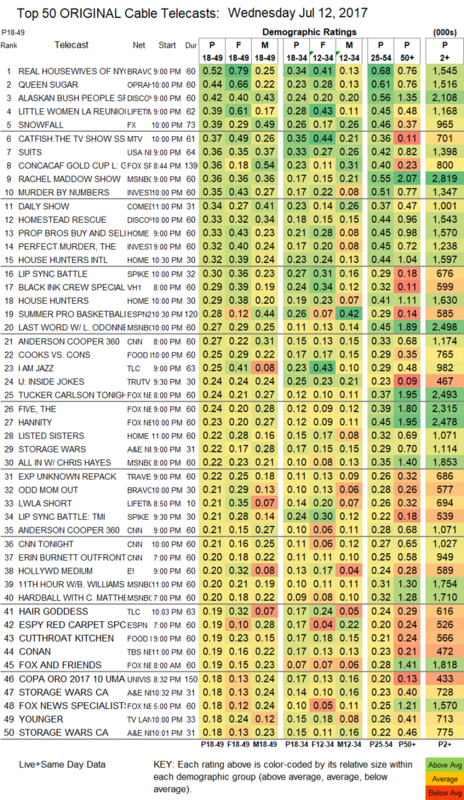 On Food Network, COOKS VS CONS ticked up to 0.25, and CUTTHROAT KITCHEN was down 0.07 to 0.19. On TLC, I AM JAZZ held at 0.25, and HAIR GODDESS was up 0.04 to 0.19. A&E’s STORAGE WARS was at 0.22. 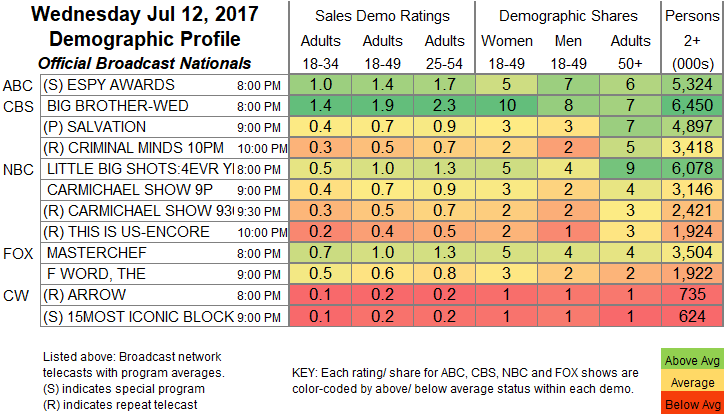 E!’s HOLLYWOOD MEDIUM was at 0.20. TV Land’s YOUNGER fell 0.02 to 0.18. The conclusion of HBO’s THE DEFIANT ONES ticked down to 0.16. Syfy’s BLOOD DRIVE ticked up to 0.14. Comedy Central’s HOOD ADJACENT lost a tenth to 0.09. BBCAmerica’s BROADCHURCH shed a tick to 0.04. POP’s NIGHTCAP remained ghastly at 0.01/110K. Sundance’s CLEVERMAN was worse, down 0.01 to 0.01/70K.